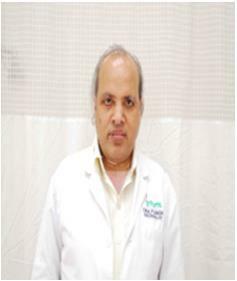 Dr. K. P. Singh, MBBS, MD (Medicine), DM (Endocrinology) is a Senior Consultant- Endocrinology? at Fortis Hospital, Mohali. Prior to joining Fortis, he has worked as an Assistant Professor, Endocrinology at Post Graduate Institute of Medical Education & Research, Chandigarh. He was instrumental in establishing the Department of Endocrinology at S.V. Institute of Medical Sciences Tirupati, Andhra Pradesh. Dr. Singh after completing his graduation, pursued his post graduation in medicine. Thereafter, he opted for super specialization in Endocrinology. Apart from this, he has accomplished fellowship training from International College of Nutrition, India. The treatment of Parathyroid Adenoma by the non surgical technique (HIFU), first time in Asia & America. To his credits, he is the recipient of WHO International Diabetes Center award from Minneapolis 2007 & National Builders award 2007. His biography has been included in the 2008 Marquis Who’s Who in World and Oxford International Biographical Centre, Cambridge, UK. During his terrific career, he has published 45 articles in International Journals on Diabetes, Thyroid, Metabolic Bone Disease and Growth Hormone. Few studies, like growth hormone therapy in burns, chronic fluoride toxicity in children, Metformin Osteoporosis link are the first landmark studies in the world. These studies have been highlighted in the Medline and has thrust him into limelight through international media response in BBC, USA Today etc. American Society for Bone Mineral Research (ASBMR). Besides, he is an active member of many NGOs who are working in the health sector. ***Dr. Kiran pal singh is best Doctor, he is kind of Boom for City People. His behaviour and Friendliness is Outstanding. He Provides best Treatment and Best Diagnosis to His Patients...I Strongly recommend his name to all diabetic Patients in City. ***Spent about 2000 bucks and one full day to meet him for my mother. He didn't give even 2 minutes to answer our questions. In that time also he was not attentive and kept attending calls and other patients. My mothers medicine was given wrong and her pulse rate became very high. WILL NOT RECOMMEND SUCH CARELESS CONSULTANTS.!! Doctors are not God or Sadhus that we can't question then and just keep listening. If that was so, we could have taken phone consultation with a much more professional doctor!! Poor job!